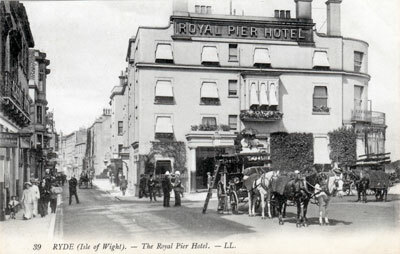 The Royal Pier Hotel, Ryde was built shortly after the original promenade Pier was opened to provide accommodation for the increasing number of visitors. With a number of other buildings, the hotel formed the north side of Pier Street. In 1930 a bus travelling down Union Street overturned on turning the corner, crashing into the hotel and killing several passengers. At the inquest, it was decided that the Royal Pier Hotel and the other buildings in the range were a traffic hazard and, as there was no other way to alleviate the hazard, the range of buildings were demolished back to St Thomas's Street and Pier Street ceased to exist.